Your message, your brand, our expertise. We’re not just a video vendor. The best video game plan is the most efficient one. We’ll help you determine what the best video ‘play’ is for you. The ways businesses are using video production is evolving. How you communicate to your employees, your customers and investors is moving from white papers, powerpoints and company memos to video. Video in quantity. In fact, video content represents 74% of all internet content today. Our philosophy is simple. Video should be the communications tool for every message you need to deliver. We create effective, affordable video strategies. All of the videos we create go through our streamlined workflow, to ensure they’re produced efficiently and effectively. So you want to use video for your marketing and communications. What’s next? We assess how your company should be using video. (Hint: FOR EVERYTHING). To start, we’ll present best practices and create a strategy for you to use video. We can help you integrate video into anything from your interoffice portal to your social media campaigns. Next, we make sure you’re using best practices to capture every message – delivered from your executives, employees or partners. Have a message you want to deliver but no footage to support a video? No problem, our animated graphic videos are a perfect alternative. We’ll take your footage, message, or even audio and we’ll deliver polished, professional looking videos for you to enhance your communications. We’re digital strategists. We’ve been working on corporate video productions for our entire careers. And we’ve been in your shoes as marketing/communications professionals. We know the everyday challenges you face. We understand the need to have impactful strategies to deliver your message in an effective and affordable way. Who are we? We’re problem solvers. We’re creatives. We’re practical. We want to help you use video effectively. Patrick is an experienced video producer, editor, and motion graphic designer. He has helped guide Steady State to create effective video content strategies for marketing and communications campaigns. These are common questions we receive. If your question isn’t answered here, feel free to drop us a line. Once we hire you, what’s next? We’ll have an initial consultation to assess your needs and present you with best practices and our recommendations. From there, we’ll educate you on everything you’ll need to know about working with us. What does it cost to hire you to create a video strategy for us? Depending on how robust your needs are, we can propose a price for a strategy that involves delivering multiple videos a day, daily or weekly. What if I have a need for a one-off video? Well, relationships start somewhere! We can custom quote a project for you. We work with some of the most talented, experienced video production professionals in Pittsburgh and across the country! 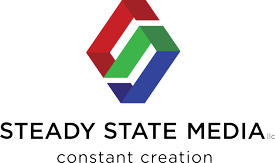 Sign Up for Steady State Media's Newsletter! Learn more about video production for marketing and communications. Fill out the form below to have videos of tips, tricks and valuable information sent directly to you! Have an immediate need? Let us know and we'll contact you! We’re full of ideas, tips, and suggestions to make video work for your business. Video Production Company Website Launch! Starring Pittsburgh football great Rocky Bleier! Another political broadcast spot from Pittsburgh’s most efficient video production company. This time, starring Pittsburgh football great Rocky Bleier! If you’re in Pittsburgh, if you’re thinking about using video production, here’s three reasons why you should! Ready to get started? Contact us to talk about your video strategy.